One of the great advantages of hang gliding and paragliding is the ability to fold or pack up a glider and hop on a flight to anywhere in the world. 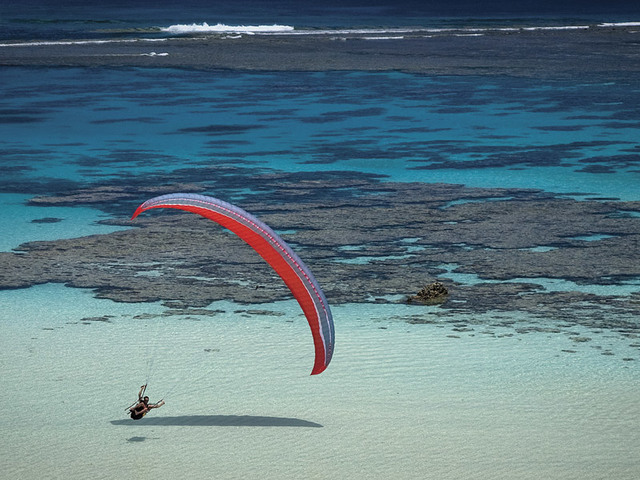 Just as surfers have circled the globe chasing perfect waves, so too have free flying pilots traveled far and wide in search of friendly skies and adventurous outlandings. Flying in North America falls roughly into four regions, defined largely by topography and weather patterns. On the Pacific coast, prevailing winds work together with onshore breeze to give pilots many options, from docile soaring along coastal cliffs, to mountain launches that overlook the ocean. The combination of mild weather and a wide variety of flying sites makes the Pacific coast a must-fly destination. 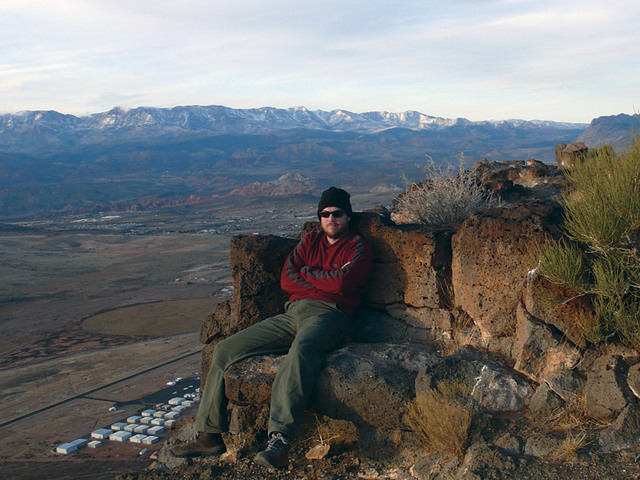 Further east lies the Mountain states and high altitude bliss. Launches can be as high as the highest flights top out along the coast – and that’s just the launch. Mountain flying can be technical and rewarding, offering huge cross country flights over wild places. In the Eastern half of the US, many free flyers get up and away by towing over the flat lands behind a winch or a tow plane. Pilots release a tow line thousands of feet in the air and enjoy the challenge of flying cross country on wide, buoyant thermals–following “streets” of clouds that mark the rising air for many miles. As winter sets in many head for the famously warm flying destinations in Mexico. Places like Valle de Bravo, Tapalpa, and Yelapa, where the doldrums of the lower latitudes provide consistent conditions and give pilots many hours of airtime. The great flying is matched by the warmth of Mexico’s people and the adventures to be found when landing near a rural road or a small town. Come back to earth in the middle of one of Mexico’s many soccer fields and children instantly appear to meet their new visitor or help pack a wing for a few pesos. Across the Atlantic, free flight is as integral to Alpine culture as great cheese and expensive ski resorts. This is the birthplace of paragliding and the ultimate destination for paragliders. Sites are everywhere and outlandings on soft green fields are as welcome as winter sun. Cable cars and funicular trains whisk pilots to the top of resorts on special discounted passes – after all, they won’t be using the slopes. After an epic flight it’s easy to catch a ride to a nearby village and celebrate with a glass of the local vintage. It doesn’t stop there. Where ever you find a hill, a coastline, a mountain or a tow rig you’re likely to find a free flying pilot. From the giant cross country flights of Manilla, Australia to over the water acro in Guatemala. From the foothills of the Himalayas to the far reaches of Patagonia, the perfect flight is waiting to be flown by those who are willing to go find it. Tom Webster grabs a self portrait at the top of Hurricane Ridge while on assignment for Paraglider Magazine. One of Jody MacDonald’s many stunning photos taken during a sailing voyage. A winch rig was mounted to a zodiac boat and used to pull pilots up over the coral reefs and crystal blue waters. 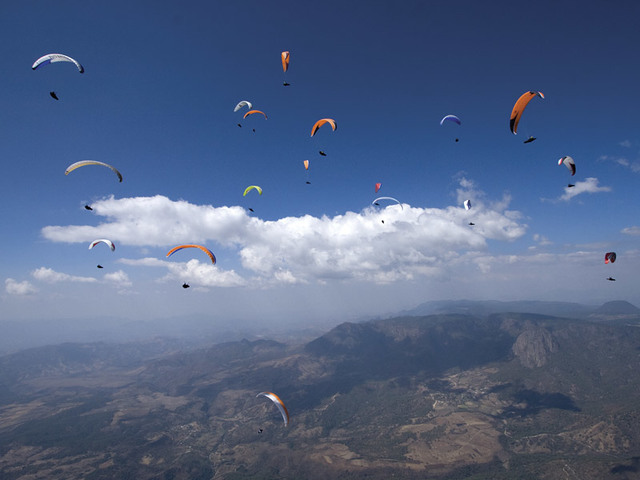 Nick Greece captures a start gaggle of pilots at the 2009 World Championships in Valle de Bravo, Mexico. Pilots travel all over the world to fly as a paraglider only takes up one piece of baggage on airlines.